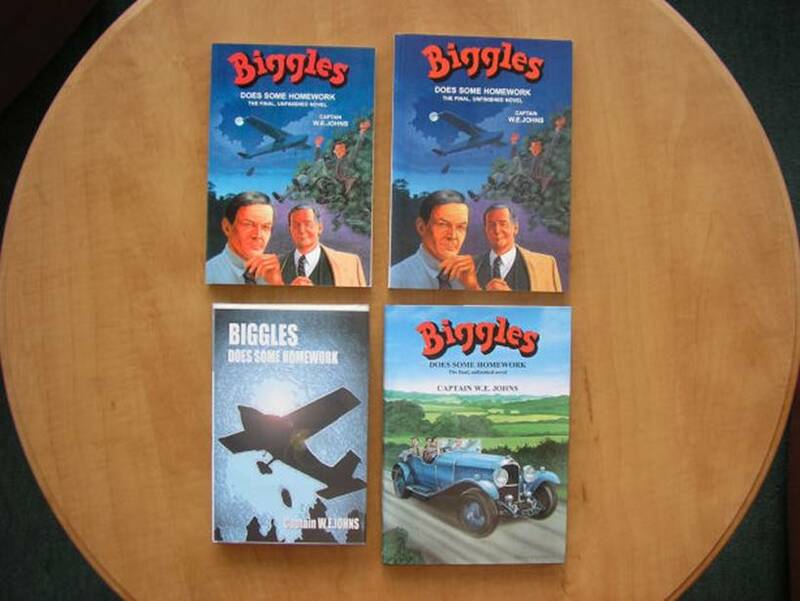 There are in fact FOUR versions of BIGGLES DOES SOME HOMEWORK ……. 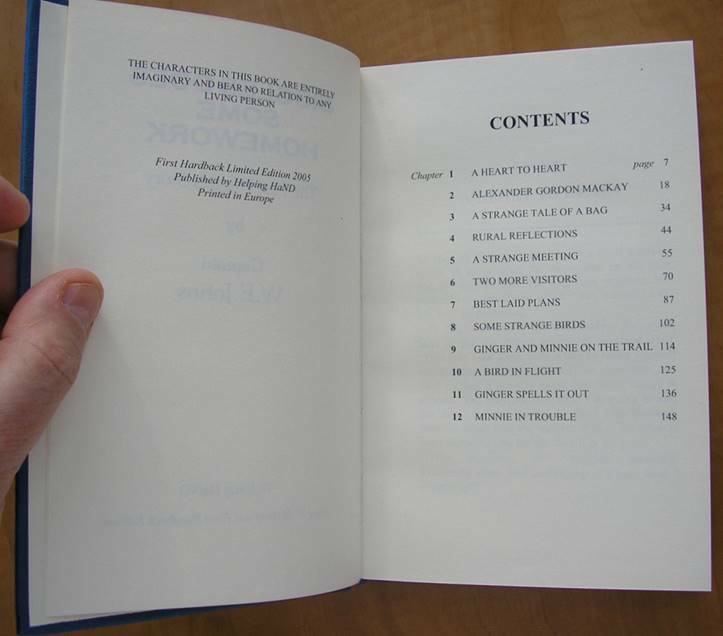 Two are genuine (they are the two on the right hand side) – published by Norman Wright and two are unauthorised publications. One of these unauthorised publications is limited to 30 books and does not try to pass itself off as the genuine book. 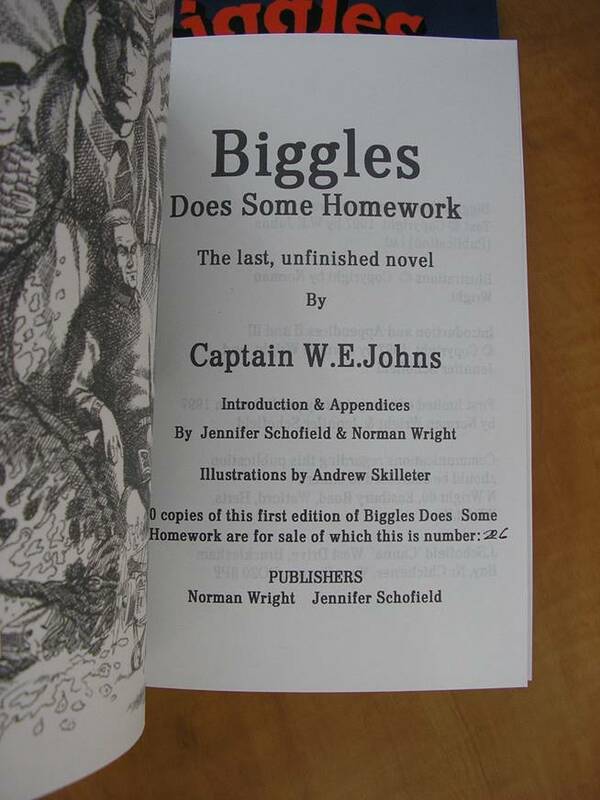 The other unauthorised publication is an attempt to copy the much sought after PAPERBACK first edition of the book. This is a complete and utter plagiarism of the book – and more importantly a criminal fraud that is intended to deceive a genuine buyer! BEWARE! The fakes of the first edition paperback are an attempt to cash in on the high prices that the real first edition is worth. The number of these particular fakes are unknown, but if somebody has gone to the trouble of having a print run done it is likely to be large. 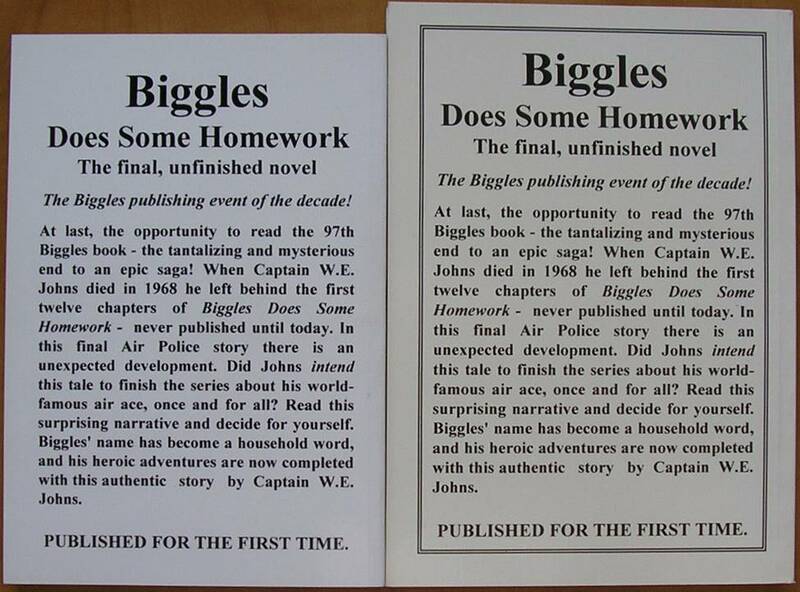 They have also had the effect of reducing the value of the real limited edition first edition paperback. You need to know the differences between the REAL GENUINE first edition and the fake. That is explained here – and I am able to do that as I accidently bought a fake in July 2016, believing it to be genuine and now have an example in my collection so I can show photos in comparison. 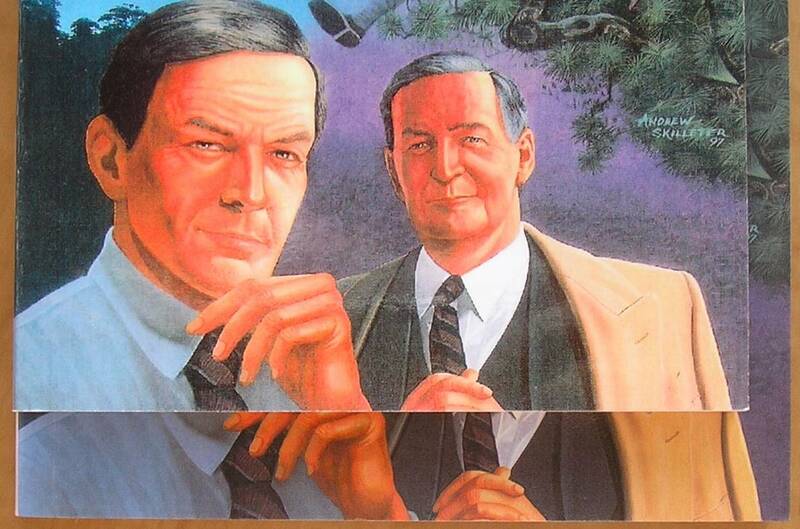 The most important thing to note is the back of the book – the FAKE is on the LEFT. The real first edition has a black border on the back! Check yours! 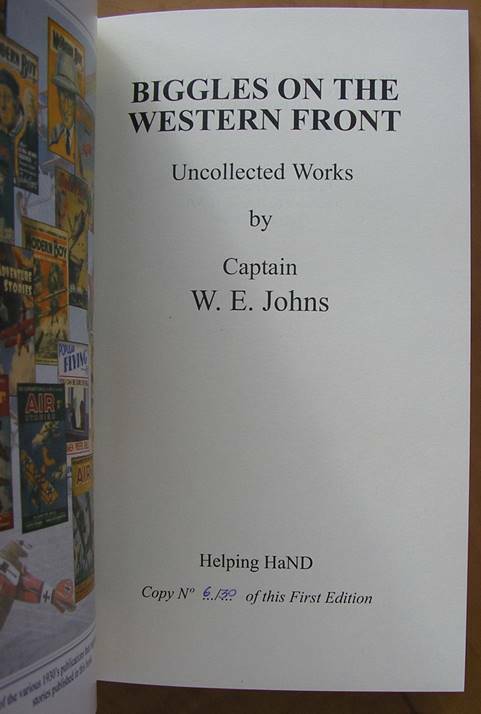 I bought my copy off an innocent person who genuinely believed they had an original first edition – until I pointed out the differences …….. they refunded my money and we came to an agreement as to the purchasing of the fake as a curiosity to enable me to make this web page as a warning to genuine collectors. There are other differences as well. Firstly the SIZE of the book. 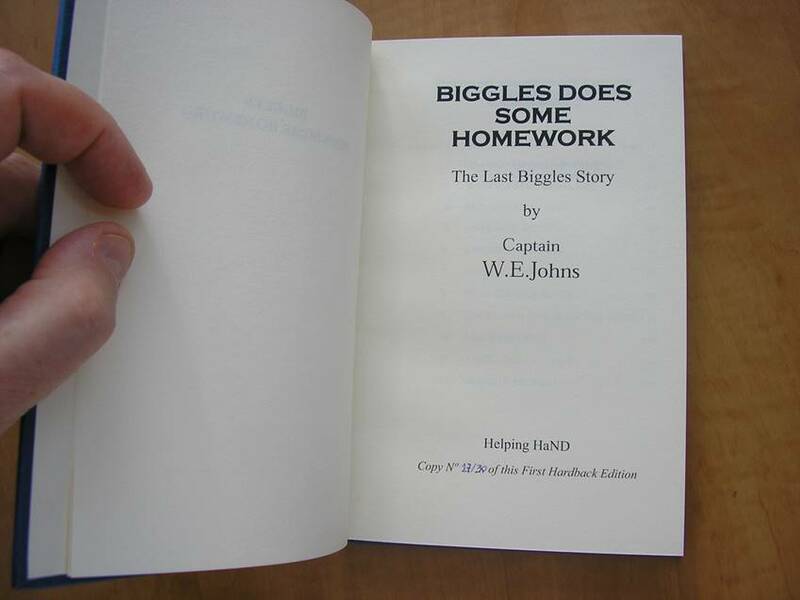 The genuine first edition is 21 cms by 15 cms. The fake is noticeably smaller, 20 cm by 13.5 cm. 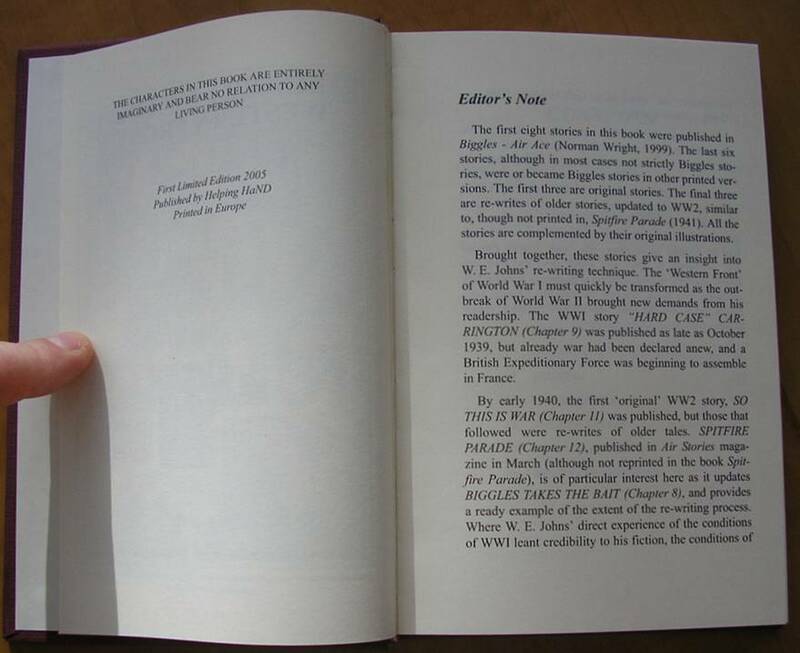 This means that the cover picture is cut off, so there are more fingers on Air Commodore Raymond on the genuine first edition and more trees on the left. There is also a clear difference inside on the title page …. 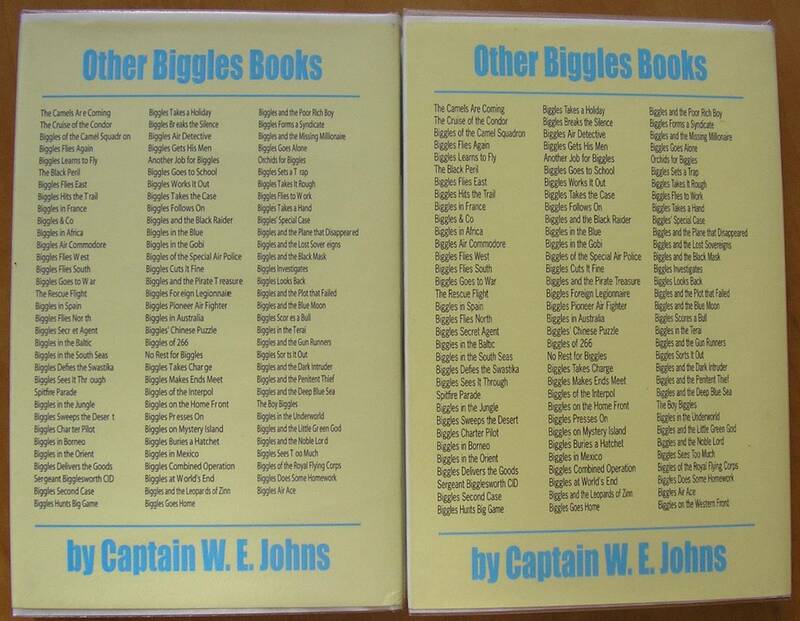 The fake is on the left – note the thinner title font – and shoddy numbering! 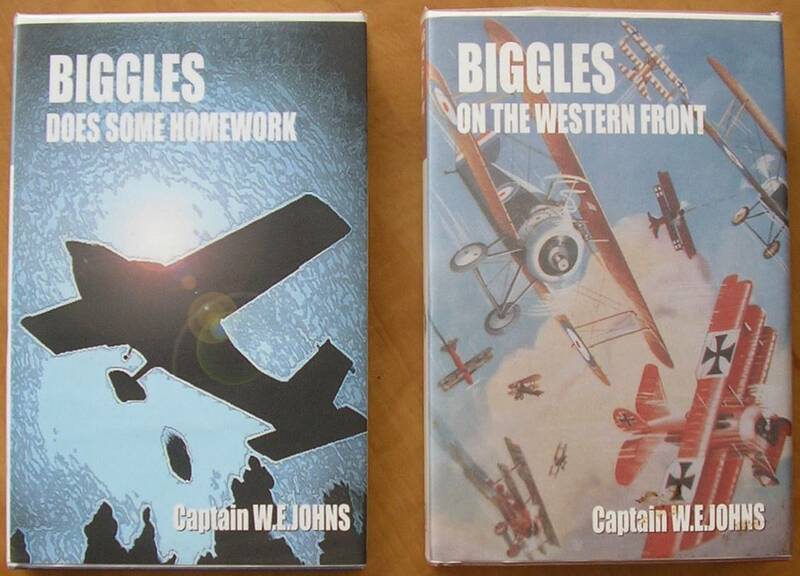 Finally, here are details of the “Helping HaND” edition of BIGGLES DOES SOME HOMEWORK. 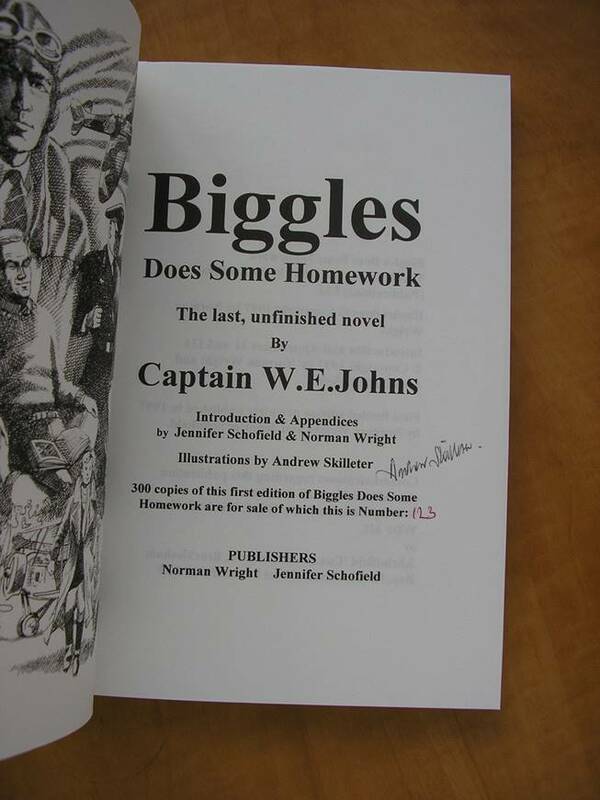 This is a limited edition of 30 copies and was the first hardback edition of the book. Again, completely unauthorised, but at least it doesn’t try to pass itself off as an original. It appears to have been produced in a style to match the Brockhampton Press originals and so sits nicely with them on the bookshelf. 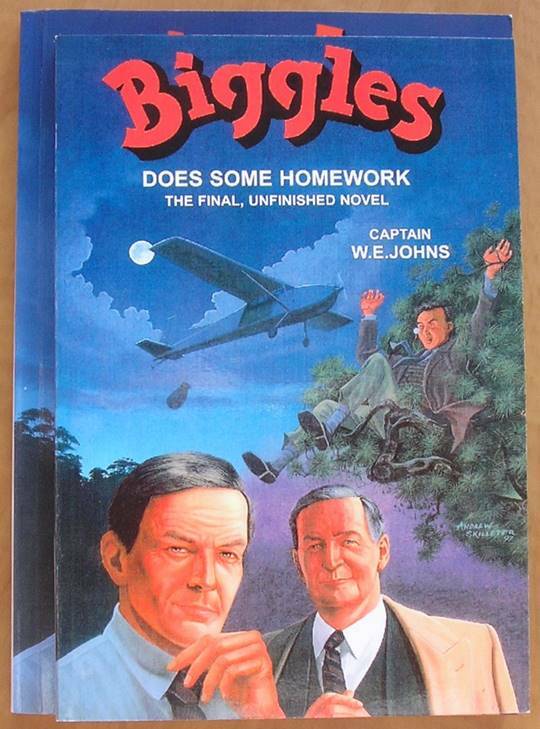 Probably one of the rarest Biggles books if there are only 30.